Why all the mystery and concealment? If there is no shame in baiting and killing this young “worldwide star,” described as “the most famous bear in the world,” why the effort to hide? After all, the hunter reportedly did not express remorse. He says he didn’t know he was killing Hope. But then again, there may be more to consider. There is, for example, the matter of the reportedly 134,000 fans, including students at over 500 schools, who have been following Hope and her family on the bear center’s website and on her mother Lilie’s Facebook page. In the debate about hunting, what about them? We don’t live in an age when people like to be accountable for their acts. Who likes to face the people they have hurt? But is protecting privacy the right choice when somebody does something that brings sadness to thousands and tears to the eyes of children and grownups? The bear center representative noted (again, through AP) that the hunter’s actions were perfectly legal. He added that the center was sorry to lose the “data set” that it was developing by following Hope’s young life. Surely, though, Hope was more than a “data set.” She was a life in her own right, who touched the hearts of many. As long as it is legal to snuff out any sentient being — death row inmates and factory farmed inmates, any free-roaming animal and any domesticated animal, an enemy combatant and a bystander caught in war’s crossfire, alleged terrorists and spies — humans will keep killing their fellows with impunity. I think it’s up to each of us to reject the immoral notion that it is natural, normal, and necessary — under any circumstances short of self-defense — to kill. That is a false view of manhood and womanhood. It is NOT our true disposition to prey upon, terrorize, violate, and eliminate others. Let’s write this message in our hearts: no one on earth — no human or other-than-human — is a resource, a profit center, a commodity, an object, a production unit, a slave, a tool, an experiment, an enemy, a pest, an expendable, a number, or, God forbid, a data set. i am a Lily follower. i started last fall when she was denned with Hope. what a treat it was to watch Lily and Hope when Lily gave birth to two more little mouths to feed: Jason and Faith. Hope was such a loving big sister and took good care of Jason and Faith when Lily went to gather bedding or a predator was around. Jason has passed from an injury, and now we miss Hope. Lily and Faith are the ones who have had their lives changed with her not coming home to them. we may feel hurt because of what happened to Hope, and maybe anger at the hunter, but the research group cannot risk loosing the right to follow the bears in their study. the law is the law. there was a petition to protect bears with collars but it did not pass. more people need to know what is going on with the group and the joys that we followers have had. i believe if more people get involved and learn more about the bear studies, maybe in time the laws will change so that the bears that have a collar will not be hunted. until then we will remember Hope with the hope that the other bears in the study will not be harmed. 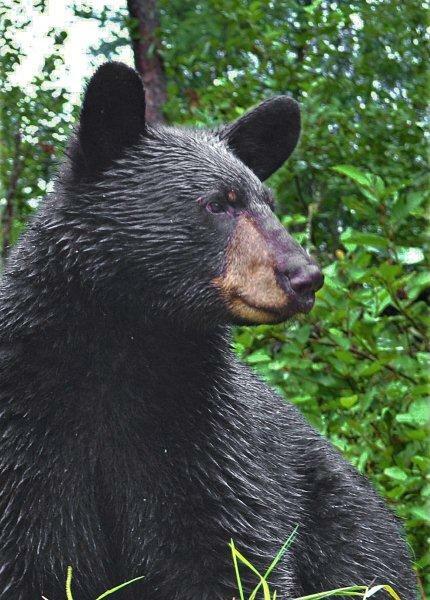 Lily can be found on facebook :Lily the black bear. please follow along with us and watch these amazing animals. I’m sorry to say that I hadn’t heard of Hope the bear until reading this blog. Why would we think that just because we happen to personally know one member of a species, that therefore that individual is somehow more “special” than her brothers and sisters? Why make it sound as if all other bears — the ones we are not privileged to know — are unimportant and expendable? In other words, okay for hunters to kill? Why would our hearts not be big enough to embrace all bears, and courageous enough to fight for all bears’ right to live free of human interference? Wouldn’t Hope want us to defend all her kin? Wouldn’t that be an unselfish way to memorialize her? Indeed, she did. She taught many unprejudiced minds who watched Hope via livestream that every bear — not JUST Hope — is a precious jewel worth protecting from harm. The children who followed Hope will not only never forget Hope, they will look upon every bear from now on with awe. These children will be tomorrow’s adults — adults who insist that it’s time for humanity to evolve beyond the self-serving, arrogant belief that man is exceptional compared to other species, that Hope is exceptional compared to other bears, and that bears are exceptional compared to other free-living animals. We — bears, deer, wolves, ants, lions, spiders, minks, wasps, beavers, snakes, cougars, cows, flies, pigs, birds, sheep, Homo sapiens (or, rather, as David Cantor of http://www.rpaforall.com advocates, Homo complexus) — are all members of one family. We are all created to express the fullness of life, not to be slain by bullets or arrows or knives or saws. For me, Hope’s specialness lies in the fact that she has paved the way for more of us to see this truth: The substance, the worth, the uniqueness, of every sentient being lies in the wealth of enduring goodness that graces each heart, not in anyone’s temporal physical parts. The hunter was engaged in a legal activity, and did not deliberately do any harm. He has every right to privacy, and to not be subjected to the zealous ire of those who refuse to see the larger picture simply because hunting offends the sensibilities of their ideology. When no wrong or deliberate harm has been done, calls for “accountability” ring hollow. @HAL 9000: I gather you would cite offended sensibilities if anyone were to object, a scant 150 years ago, to a plantation owner’s name being kept secret after he legally whipped his property to death when that same property was caught trying to escape. As long as he didn’t intend for his property to die, it was nobody else’s business, for sure. Perhaps, HAL, by the year 9000 — but I hope in a third that time — it will also be illegal to gun down a bear or any other creature for any reason, including attempting to escape the gun sights or bow sights of murderous humans. May a spark of compassion and a flame of justice for animals alight in your heart. May you awake one morning to the realization that it’s time to defend them from immoral laws instead of continuing to defend barbaric institutions and their adherents, which do no one any good. Jeez, reading the comments of Tammy Wood and Hal 9000 makes me even more astonished that we can stand to look at one another. This was a living sentient being simply trying to live their life. Killing an innocent being is murder and that’s that. Squawk all you want about “law”…all the crap that went on in Germany from 1933 through 1945 was “legal”. Disgusting and repugnant the whole sordid thing. Trying to equate hunting with slavery, homicide or the enormity of the Third Reich is a false comparison and an attempt to abandon rational discussion for rhetorical indictment. It’s indicative of resorting to character assassination in the absence of any substantive point. I am a hunter, omnivore and an advocate and practitioner of the philosophy of animal welfare. I’ve discussed and debated at length with animal rights advocates, and ultimately found many of their arguments lacking. Still, I don’t begrudge other people for holding those views, or question their sincerity of motive. A complexity of viewpoints is vital to the awakening and advancement of humanity. That animals and the environment are often regarded too flippantly or in terms of sheer commodity in our grossly materialistic society is axiomatic, and perhaps therein lies the common ground. Though hardly an expert, I am well versed in wildlife biology and conservation; I love the outdoors and ecology is one of my favorite subjects. Based upon what I know, I have mixed feelings about predator hunting in general and bear baiting in particular. The fair chase ethics of baiting have sometimes been vigorously debated among hunters and wildlife managers. Some states have banned it. Having spent considerable time in the company of professional wildlife experts, I’m left dubious about the methodology behind the research being done on these bears. From what I can gather, the researchers crossed the line of detached observation and became too close – physically and emotionally – to the bears. That’s not good science. Also, as the public is pulled into that circle, it might not present the best prism through which neophytes could gain understanding of wild creatures and the natural world. Instead, it seems to have helped manifest what amounted to sentimental tunnel vision. And yet, perhaps one should not be too jaundiced toward any sincere attempt to bring a window into nature to a human population that is increasingly urbanized, suburbanized and disconnected from the natural world. I think a strong argument can be made for a proportionately causal relationship between that disconnection and the dulling, on an epidemic scale, of our intellectual prowess and realization of spiritual capacity. The only dulling of intellectual prowess and realization of spiritual capacity going on is among those who, over the millennia, have refused, because of cultural indoctrination and false superiority, to see animals as a child does — with a desire to preserve them instead of kill them. Only when we become as little children will we possess true spirituality. Doing violence to any individual, no matter the species, is an adulteration of our innate childlikeness, and a desecration of our all-good, pure, perfect, solely-spiritual individuality. The idea that Hope was particularly “special” because she furthered human wants fails to acknowledge that everyone’s life is unique and worthy – Irregardless of who makes a claim or has benefit. Hope and the grief over her murder reveals a very narrow, subjective and selfish view towards all other bears not as lucky to be her. Up a few rungs on the human social scale, it’s classism. And Hal9000 – I suspect the reason you don’t begrudge other people for holding a different view is that you might have an unacknowledged thought that they just might be right about valuing all life… I can’t imagine you’d let a thief or a child molester hold a different view. No… Animal rights advocates are in another category… They don’t want anyone hurt or killed. That philosophy resonates with everything each one of us born into modern culture has been taught. It is what’s echoed throughout our lives. In civilization’s attempt to evolve we want to renounce needless harm. In literature and history the bad guys are always the ones that kill without provocation… Those who snuff innocent lives are NOT the heroes. Everyone chooses a side. The hunter, the meat-eater, the animal users… Vs. Those who wish to limit harm. It is very easy to see why no one would begrudge the latter view. It’s right. Finally, I also have a hunch that you judge the arguments you’ve had with animal rights activists as “lacking” is because they did not see your (wrong) POV. Killing without necessity has no reasoning only excuses. And I’m sure you can offer up a passel of them – But I bet each one lacks some key ingredients like justice and compassion… I think we’re all capable of better than that – If only for our own sake. Speaking of detachment…I recall how Jane Gooddall was berated for being too close to the chimps she was studying, Yet her research discovered worlds of knowledge about primates and helped usher in a new level of respect for them in society. Detachment has its place, but in studying animals it serves to objectify them and numb researchers’ empathy and compassion for them. Animals cannot be treated like things. And you can’t really know an animal until you’ve entered into a mutually trusting relationship with the animal and let the animal express his or her full range of physical and emotional behaviors in your presence. Speaking of “fair chase”…There’s nothing remotely fair about a human chasing an innocent creature who doesn’t want to be chased, and then trying to murder him or her. The more distressing tragedy is that so many people actualy enjoy doing that. Enjoyment from harming animals is sick and prevents one from truly having an empathic, respectful relationship with animals. To be fair, don’t chase. It’s good to love the outdoors, but please also love the outdoors’ sentient citizens. When you do, you will see that the arguments that we “have” to kill them are hollow excuses for justifying an addiction to hunting. We certaibly have the creativity and brainpower to manage animal populations in a nonviolent way that respects their lives. Do we have the willpower and the self-restraint? Again, attempts at equivocation,and appeals to absurd hypotheticals do not good arguments make. They only betray a weakness of underlying position. I don’t begrudge animal rights advocates their views for the same reasons I don’t begrudge any sincere disagreement. First, I’m secure in the rightness of what I think. I weigh things according to reason, the best factual knowledge available to me, and in accordance to my own investigation of reality. I can and should respectfully consider the views and conclusions of others. But nobody else can think for me. Secondly – and as a logical result of the first reason – I have no need to evangelize others to my point of view. I might not agree with, or ultimately not even see objective value, in a point of view. But it’s not my place to tell others what to think. Some disagreements are seemingly intractable, and some ideologies are so zealous in their own sense of rightness, they risk becoming especially obtuse in their inability to process new information or differing points of view. That’s out of any particular individual’s hands. The truth will stand, regardless. At present, the greatest threat facing wild animals is habitat loss. And, as I indicated previously, therein might lie the common ground, and common goals to strive for. Sentimentally has its place. It’s part of what makes us human beings. However, to agonize over the fate of any particular or every individual creature can actually be counter-productive. Rather, the needs demanding to be met take place on the species level. And, even more importantly, at the level of habitat preservation. It is on those levels that hunter/conservationists and similar conservationists have striven. That’s not to say others with differing views don’t have some valuable ideas. But I question the pragmatic application and actual results of sweeping, idealistic doctrines based upon a sense of equality and magnanimity that does not exist in nature or among and between wild creatures – and ultimately might not even square with reality. As I’ve said, ecology is one of my great passions, and an increasingly dire concern. I’ve no use for rhetoric or pontificating upon a supposed error of ways. I’m interested solid, rational ideas and results. Is that which might supplicate our emotional attachment to a particular bear really what’s good for bears, as a species, for the habitat they live in, and all the other species that dwell therein? How do we secure a future for wildlife? What, if anything, can we do about developmental sprawl that is destroying their habitat and disrupting their migration routes? How do we deal with conflicts between human interests and wildlife in the interface zones between wild and settled areas? How do we convey the importance of wild places and creatures to a population surrounded by concrete, steel and electronics? To a people so distant from the earth and her creatures, they might not even be any longer be aware of such vital connections? As to the hunting of bears: Like any endeavor in contemporary society, hunting has at times been reduced to its lowest, and laziest, denominator. Such travesties as fenced-in “game farms” – set up to rake in extravagant profits by offering access to easy kills for the mere thrill of it – are reprehensible. Does bear-baiting fall into that category? That might depend upon the circumstances. The situation in the almost unimaginably vast and truly wild territory of Alaska might call for it. But could applying it in a semi-settled, pastoral countryside in the Mid-west give the hunter an unfair advantage? I’ve had the privilege of observing both brown and black bears in the wild. But I’ve never hunted bears, so my knowledge of that pursuit is limited to what I’ve heard second hand. I have gathered that they can be an incredibly challenging species to hunt, regardless of the tactics applied. I’ve also never set foot in the forests of Michigan. So my suppositions on the subject in that setting carry an accordingly diminutive weight. @BlessUsAll your replies are simply beautiful. I literally could not say it better myself. You are right on every level. I pray one day humans will regard animals with the respect and love they deserve. What a world we live in.